Last year saw a sharp rise in the number of dengue cases from 2017, with 3,285 cases reported. This was almost 20 per cent more than the 2,772 recorded in the preceding 12 months, the National Environment Agency (NEA) said yesterday. That trend has continued into the new year, with the first week of 2019 seeing 207 cases - the highest weekly number since September 2016. A contributing factor and key concern is the increase in the Aedes aegypti mosquito population detected in the community, said NEA. Last month, the agency's Gravitrap surveillance system detected about 40 per cent more Aedes aegypti mosquitoes, compared with December 2017. Gravitraps are traps that catch Aedes mosquitoes and collect data on them. The NEA noted that although there is no signal for a major outbreak, the increased Aedes mosquito population in the community, coupled with the high current number of dengue cases, may lead to a surge in case numbers this year. The figures of the past two years, however, are far lower than those of the preceding years. Between 2013 and 2016, the annual total of dengue cases was above 11,000. 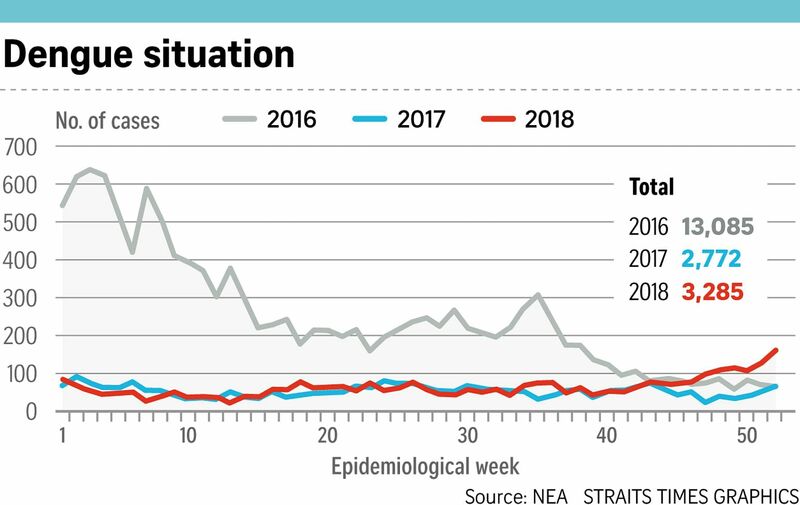 Among reasons for the sharp drop, the NEA said last year, were the immunity of the local population following the high number of dengue cases in the past few years, and the use of more Gravitraps (from a few thousand deployed in late 2015 to about 50,000 currently). Last year, the NEA conducted about a million inspections for mosquito breeding which uncovered 18,000 breeding habitats. About 4,100 households were fined for breeding and 40 construction sites were issued stop-work orders. As of Tuesday, there were 37 active dengue clusters, while the biggest cluster in the past two weeks was in Bedok Reservoir Road, with 24 cases, followed by that in Pandan Gardens, with 15 cases. With Chinese New Year approaching, the NEA has also urged more vigilance in spring cleaning, such as disposing of refuse and decorating with ornamental plants, in order to avoid unintentionally creating mosquito breeding habitats. Ms Chua Lay Choo, 70, who works in online goods packaging, said she noticed her neighbours clearing flowerpots and emptying pails at Block 136 Bedok Reservoir Road on Tuesday. "It's reassuring to see this, as these are usually the main cause of mosquito breeding." The NEA has urged the public to be vigilant and to remove mosquito breeding habitats in order to prevent the spread of dengue, as well as zika and chikungunya viruses. It also cautioned those travelling overseas to "mosquito-proof" their homes. This includes covering toilet bowls, sealing the overflow pipe of the flushing cistern and adding sand granular insecticide to areas where stagnant water cannot be easily removed. Updates on the dengue situation can be found on NEA's website, the Stop Dengue Now Facebook page, or the myENV app.